Sevilla were one of the overachievers of last season, winning the Europa League and finishing 5th in La Liga. While they’ve had a torrid start to this season, they managed to lift themselves for the big game against Real Madrid and win 3-2. 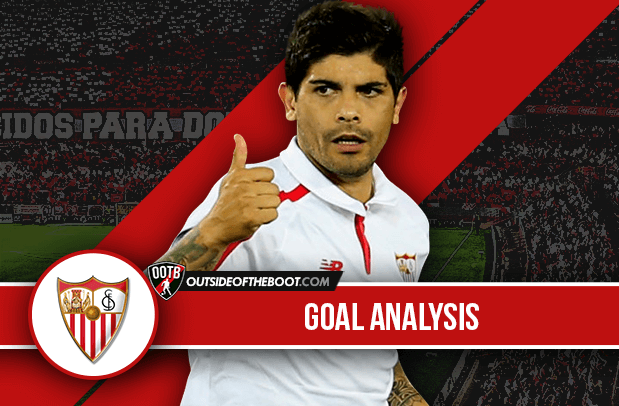 Alex Clapham analyses the goal scored by Ever Banega. Real Madrid travelled to Sevilla as La Liga leaders and started far brighter than the Andalucians; who have struggled to find the form they hit in the 2014-2015 term, seeing them finish in a highly respectable 5th position and lift the Europa League trophy, mustering up only 3 wins from their first 10 fixtures this season before this encounter. 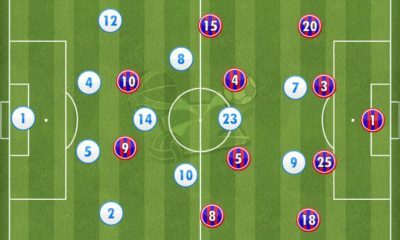 Madrid started quickly with the 4-3-3 system adopted by Rafa Benitez in hope of supplying talisman Cristiano Ronaldo with as much service as possible from wide areas. 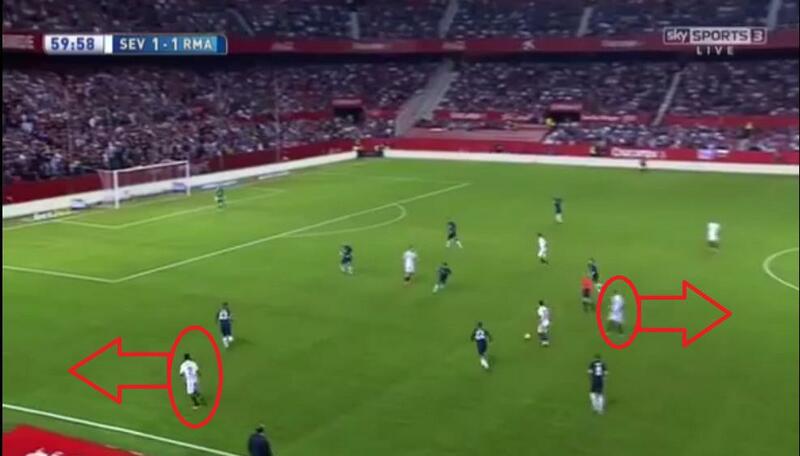 Gareth Bale and Isco were the wingers trusted to provide. Opportunities fell to the visitors who found Sevilla’s Sergio Rico in spectacular shape between the sticks. As a vicious Nacho volley struck the inside of the post and bounced to safety, Real turned up the pressure even higher and when a Bale cross was blatantly handled inside the area by Adil Rami, referee Jose Gonzalez waved all claims away. 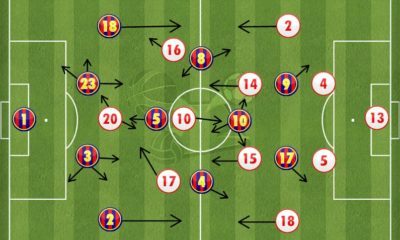 As Los Blancos managed to find the Croatian magician Luka Modric more frequently, the circulation of their play became too rapid for Sevilla to contend with, even with Ever Banega dropping into central areas to create a 5-man-midfield for the hosts. The breakthrough finally came on the 22-minute mark when an Isco corner was converted in spectacular fashion by Sergio Ramos whose overhead kick from 15-yards out found the bottom corner. 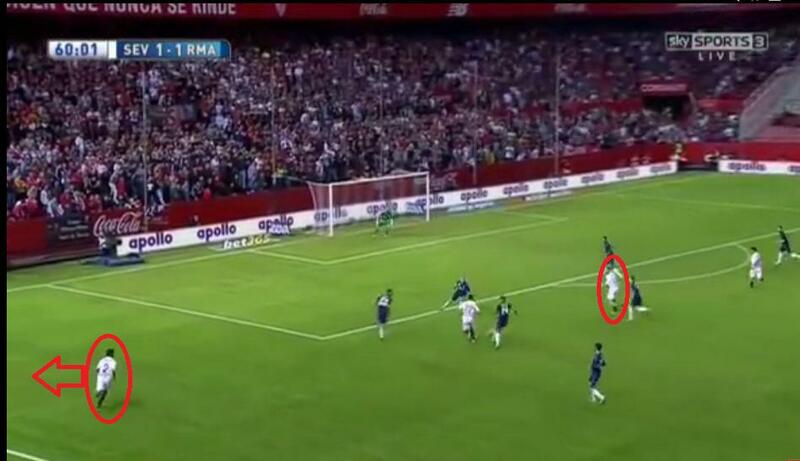 However, as the Madrid players fled to celebrate with their captain, he was still on the ground after an awkward landing on his right shoulder following the breathtaking effort to give his team the lead. Sergio Ramos Garcia was born just streets away from the Sevilla’s stadium in the Nervion neighborhood and started his professional career there having spent seven years in the academy at his boyhood club before leaving for the capital in 2005. 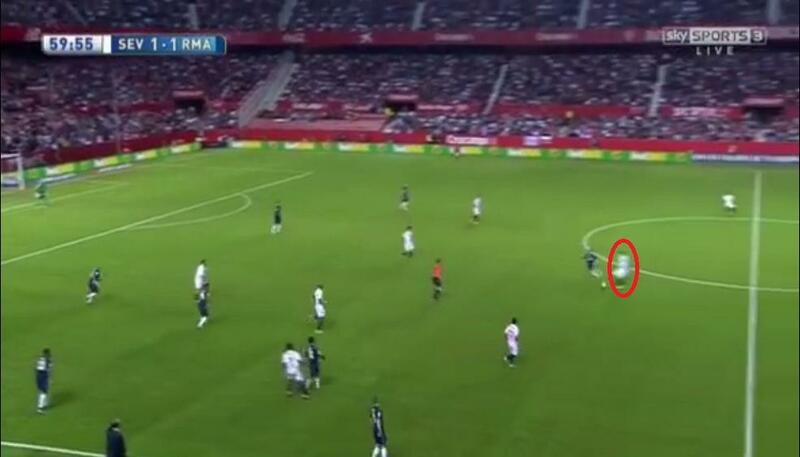 The 29 year old was forced to leave the field of play due to the injury and was substituted by Rafael Varane. The 22-year-old Frenchman replaced Ramos in the heart of defence, but something that was not replaced for the remainder of the evening was the leadership and control that the club captain gives to not only the backline, but the whole of the team. As the central defensive pair of Pepe and Varane looked shaky, Sevilla’s confidence grew and crosses were fizzed across Madrid’s 6-yard-box on numerous occasions. Boosted by the support of more than 40,000 fans, the hosts bombarded the left-hand side as Ukrainian Yevhen Konoplyanka was having all kinds of joy terrorising Real’s Danilo who is filling in for the injured Carvajal. Crosses came low as the hosts’ Italian central striker Cero Immobile stands at only 5 feet 11 inches compared to Pepe at 6ft 2in Varane who stands at a whopping 6ft 4in. Glorious openings arrived Sevilla’s way and they were rewarded for their positive reaction to conceding when Immobile volleyed home to level from an acute angle after a Konoplyanka corner avoided everyone. With the physical presence of Steven N’Zonzi alongside him, Konoplyanka has the assurance that the Frenchman will be backing him; which gives a special freedom to remove the defensive shackles and stream forward to assist and often be at the heart of attacks. 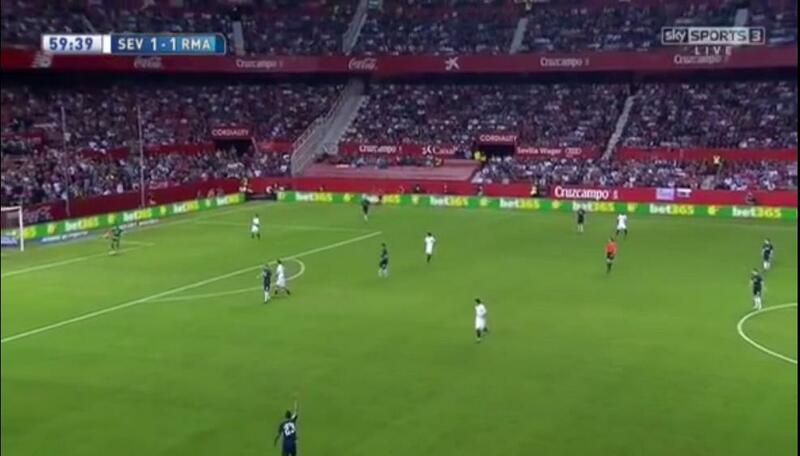 Sevilla ganged up on Real Madrid and with an incredibly high pressing line, even the world class stars were panicking and making mistakes when on the ball. As Madrid’s Casemiro intervened a move between Tremoulinas and N’Zonzi, the latter was quick on his heels and the Brazilian misplaced his pass; which Sevilla’s central defender Marco Andreoli was able to clean up inside Madrid’s half due to the intense pressing of his team. As Andreoli immediately released the ball into the ever-dangerous Konoplyanka’s feet, Real were far too slow to close the Ukrainian down and he was left with what would be to many players a daunting task of going up against Casemiro in a 1-against-1, but not to this player, not on this night. The Brazilian was treated as though he wasn’t there and when Konoplyanka jinked past him with a nonchalant drop of the shoulder, the Sevilla faithful rose to their feet expectantly. Throughout the evening, Immobile had been making runs away towards the far post, however on this occasion he stayed still at the edge of the box; attracting the close attentions of central defenders and leaving a hole in-behind as a result. 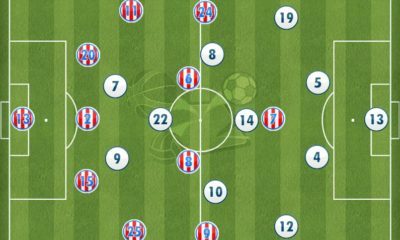 The hosts always had the outlet on the left through Tremoulinas and this pattern of play was no exception, however, this time the Konoplyanka opted against playing the ball wide. 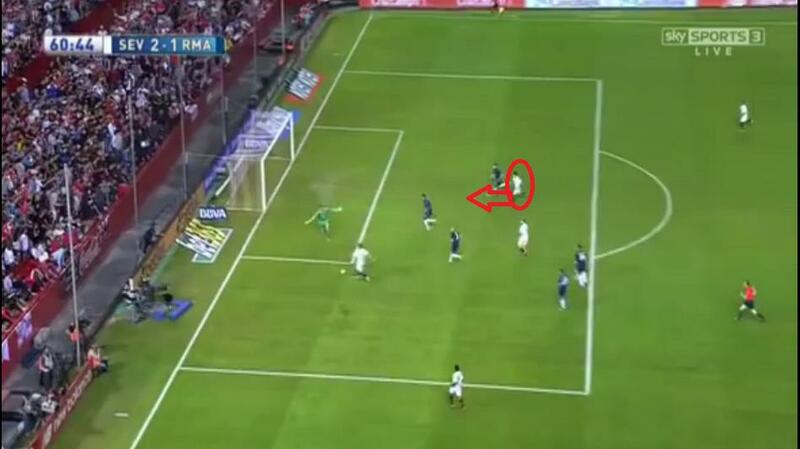 He drove at the Madrid backline and fed the ball into the feet of Immobile who bounced the ball beautifully back around the corner into his path as he used his momentum from his original sprint to beat Pepe for pace. As the 26-year-old found himself at the byline with Real keeper Keylor Navas dashing out towards him, he slipped a sensationally weighted pass into the road of the on-rushing Ever Banega; who was delighted to fire home from close range to turn the game on its head completely. With the stadium rocking and opposition shaken and looking more like rabbits in headlights than European heavyweights, Sevilla were urged on further and 13 minutes later Llorente headed a third goal to give Sevilla daylight, again, following a move that consisted of Konoplyanka taunting defenders and linking up with wing-back Tremoulinas. Sevilla could have put the game to bed with a string of opportunities to make it an embarrassing scoreline for Real Madrid, however, with great thanks to their goalkeeper Keylor Navas, Los Blancos stayed in the game and a terrific James Rodriguez strike deep into injury time made for a few frantic moments in the dying seconds. The men in red and white held on to record a memorable 3-2 victory to send the Ramon Sanchez Pijuan faithful home happy whilst singing the name of their new hero “KONOPLYANKA”. The Ukrainian was worth the entrance fee alone. Alex is an Englishman that is currently working as a coach and performance analyst at the academy of a professional club in Spain. As a season ticket holder at the Camp Nou stadium, Alex gets a close up view of the goings on at FC Barcelona; from the youth teams, right up to Messi, Iniesta, Neymar and co.